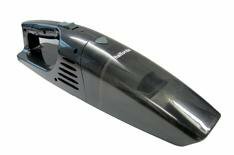 Halfords 12V Car Vacuum Cleaner | What Car? Put this cleaner in front of loose muck and it'll soon guzzle it up. Faced with ingrained dirt in carpet, though, and it begins to struggle. Using the brushing tools helps, but the suction isn't quite up to the toughest jobs. Powered by plugging it into a 12V cigarette lighter socket, the 4.5-metre cable can prove awkward when it gets caught around the various bits of a car interior that stick out. A power button that needs to be constantly pushed is also irritating. This cleaner offers what you'd expect for the price. It does a reasonable job without being startling. Discounts are impossible to find, as the cleaner is only available through Halfords stores. An all-black design adds a touch of class that raises this cleaner above some of its rivals but only just. There's nowhere to store the power cable or three attachments, which make it an awkward long-term ownership proposition. The three attachments include two brushes and a crevice tool. They are all reasonable, but are not particularly hard-wearing.